It offers a day of reflection and conversation for Friends of Nano, Co-Workers & Associates on the theme: ‘Not Words but Deeds’. (From the Nagle Family Motto). 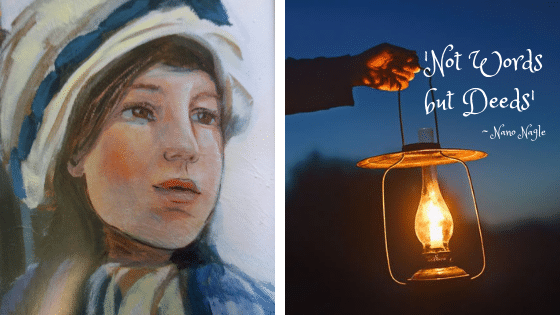 Judie Chalmers (Drama) – “Path Through the Dark, The Story of Nano Nagle”. Reservation and payment is essential by June 4th. Cheques should be made payable to: ‘Friends of Nano’. Please post completed applications to: Anne Dwyer (Project Officer, FON Ireland), Friends of Nano Office, Westgate Thurles, Co. Tipperary. Presentation Sisters in Ireland and across the world were traditionally associated with schools following in the tradition of their foundress, Nano Nagle. However Nano Nagle had many initiatives beyond schools - a home for widows, prison visitation; an outreach to those in prostitution in Cork docks, evening education for adults. Today the Presentation Sisters continue to take new initiatives in line with the pressing needs of our day.